The excellent photos may have you overlook the Epson PM-400’s premium price. Not long ago, sharing photos meant taking negatives to the drugstore and having them make prints. These days it’s all about Facebook, Instagram, Flickr, or whatever photo-sharing social networking site you can name. While we no longer rush to the photo lab to drop off film rolls, photo printing is still very much alive: A recent 2015 survey by InfoTrends found that 27 percent of participants who have printed from their mobile phones, say they would do it again. Another 23 percent say they plan to, but haven’t yet, while 16 percent say they didn’t realize it was possible to print from a phone, but would like to try it. The last figure is encouraging, according to InfoTrends, because the respondents are between the ages of 13-24 – printing is suddenly cool again. With our smartphones, tablets, and computers, it’s easy to transmit photos to online services or even traditional retailers like Walgreens, Costco, and Target, which will deliver prints to you by mail or have the available for pick-up. You can also print photos at home, using a regular color inkjet printer or a dedicated, specialty photo printer like Epson’s new PictureMate PM-400 Personal Photo Lab. The little unit prints 4 x 6 or 5 x 7 photos, and can function on its own, without a computer; unlike portable photo printers that came before (the PM-400 isn’t a new concept, although it has been a few years since we’ve seen new specialty photo printers like this), the PM-400 is designed to work with today’s mobile devices. But, for a printer whose only job is to print small photos, the convenience of a home photo lab comes with a rather high price. The PM-400 is small and lightweight (9.8 x 6.9 x 3.3 inches when folded up, and 4 pounds), making it highly portable. Drop down the front panel, which serves as the output tray, and lift up the top panel, which exposes the input tray, and it’s ready to go. On the top of the unit is a 2.7-inch color LCD (non-touch), four-direction control pad, and keys for Home, Back, Start, and Stop. Initial setup involves inserting a single ink cartridge that contains all four colors (cyan, magenta, yellow, and black), and installing the print driver (downloaded from Epson’s support site) if you are connecting the printer to a computer. Connectivity options include hardwire USB 2.0, or wireless Wi-Fi and Wi-Fi Direct (which connects directly to a Wi-Fi-enabled device, without going through a network). No Ethernet port is provided, but that’s no loss since this isn’t a business machine. 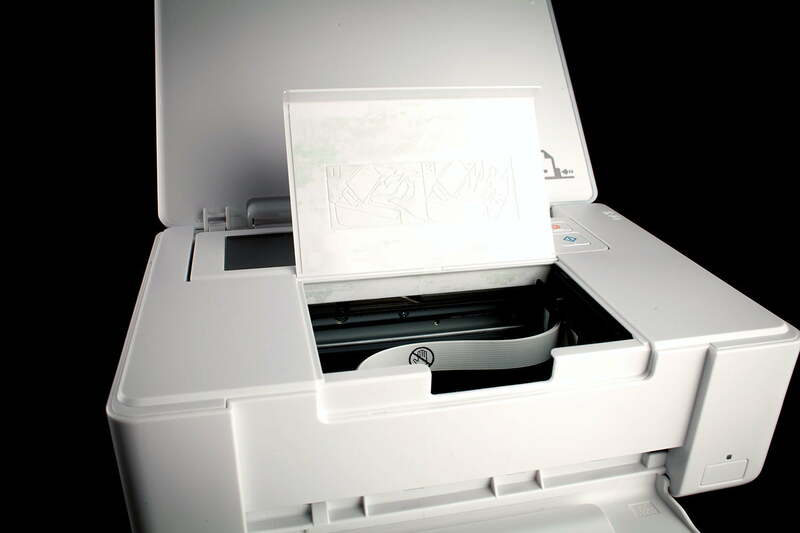 The PM-400 supports all of the mobile protocols like Apple AirPrint, Google Cloud Print, and Epson’s own Epson Connect, Epson Email Print, and Epson iPrint apps. 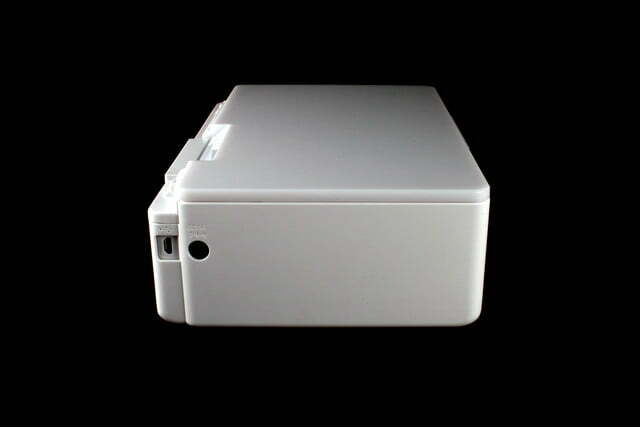 The PM-400 can print photos as small as 3.5 x 5, or as large as 5 x 7. There are two USB ports. The port on the left side is Micro USB, which is for a PC connection (Windows or Mac). Although most printers use a USB A/B cable, this isn’t so unconventional as so many mobile products use Micro USB cables – you probably have some lying around. On the right side is a standard USB 2.0 port connecting thumb-drives, cameras, or even a USB portable hard drive; it cannot be used for PC connections. Next to this port is a SD card slot. One thing missing from the PM-400 is a battery. 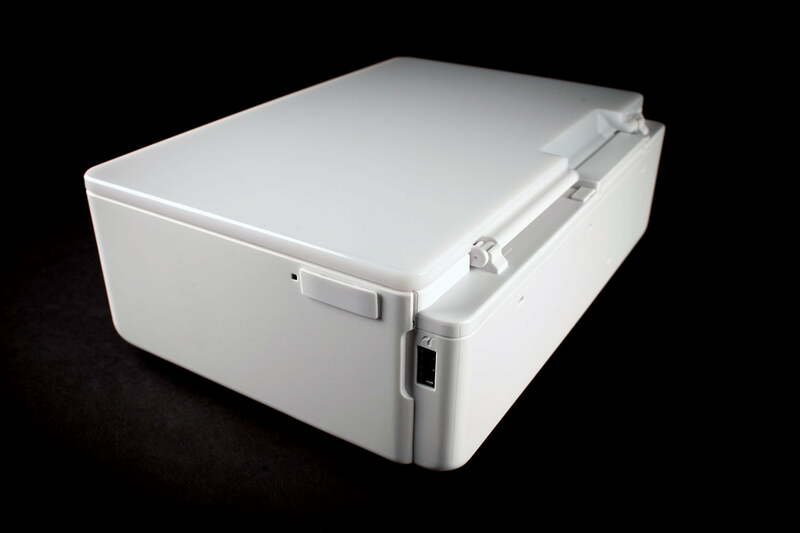 Some past photo printers offered this as standard or as an option, allowing you to bring the unit along for remote printing – true portability. You can still do this, but you’ll need a power outlet. The PM-400 comes with a power supply, four-color ink starter cartridge, and a few sheets of 4 x 6-inch Glossy Photo Paper. No USB cable is provided, but since the PM-400 offers a wide variety of wireless connectivity options, you may not need it. 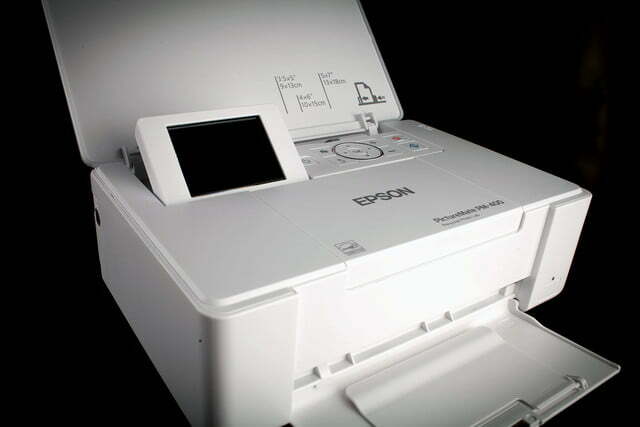 Epson covers the PM-400 with a standard limited one-year warranty. Using the PM-400 couldn’t be easier. In addition to printing from a PC, as mentioned, you can print off an SD card, flash drive, smartphone, or tablet. When a SD card or flash drive is plugged in, the PM-400 scans them and finds the printable photos. 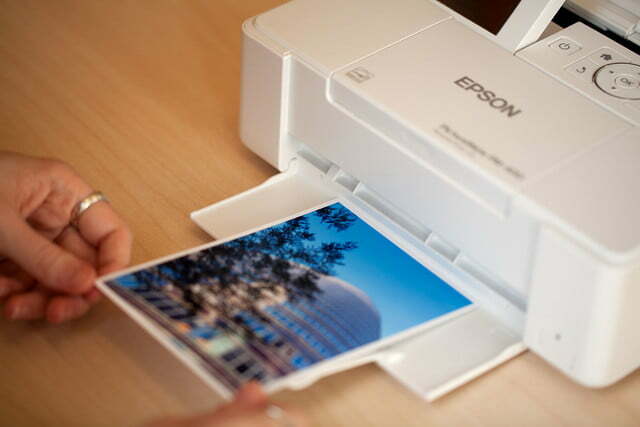 You use the arrow keys to select the photos you want to print, either individually or from a proof sheet, although this can get tiresome if you have a lot of photos to go through (we wish Epson had used a scroll wheel or added touch capability to the LCD). You can make adjustments, such as red-eye reduction, using the LCD. With mobile devices, you can use the iPrint app to select the photos from the camera roll, or print from online cloud services, as well as make basic settings adjustments. With an iPhone, you can also print directly from the camera roll via AirPrint by tapping the “share” icon and choosing “print”; the PM-400 automatically pops up as an available printer, provided everything is on the same network. Besides 4 x 6 and 5 x 7, the PM-400 supports 3.5 x 5 and number-10 envelopes. 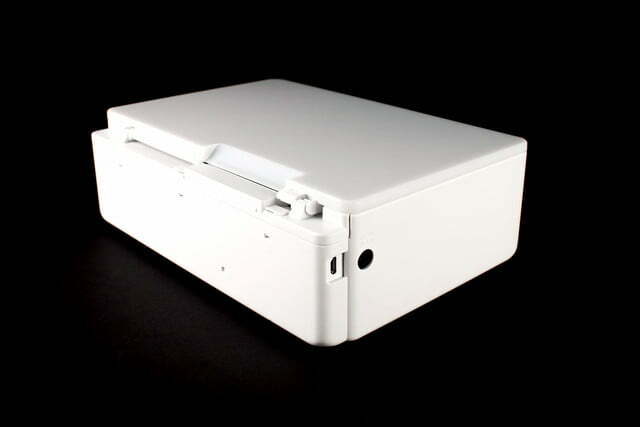 The input tray can hold 20 sheets of glossy photo paper at one time. Printing is fast, and quality rivals what you would get from a drug store. Printing is fast. 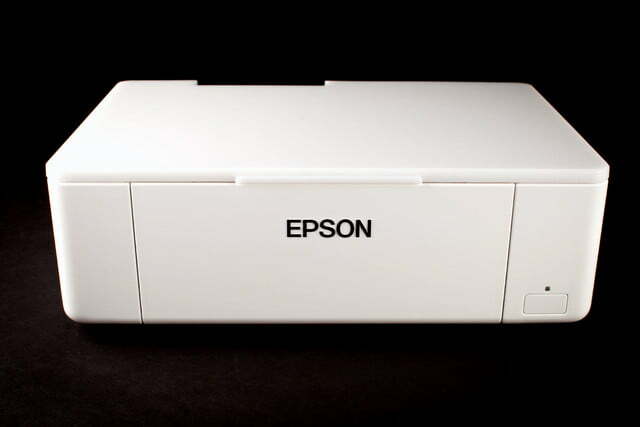 Epson claims an average of 36 seconds per print (it varies depending on the content of the photo). The PM-400 uses dye-based ink, so the prints are vivid, scratch resistant, and smudge proof. Overall, print quality is excellent, rivaling what you would get from a CVS or Walgreens. Even shots from good-quality smartphones came out looking nice. We attribute this to the four-color ink tank versus ones that use three colors. 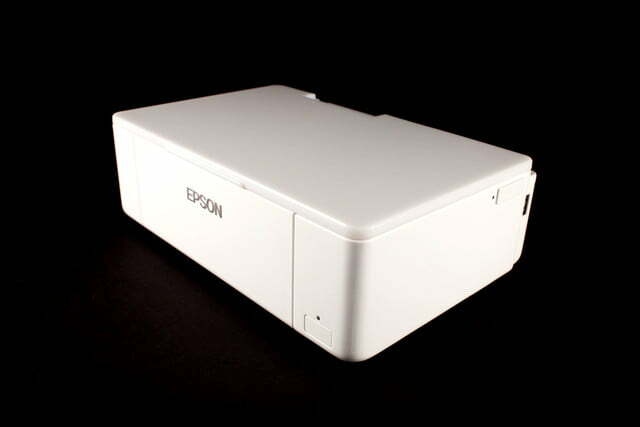 Epson claims a 200-year life for the print; unfortunately, it’s not something we can put to the test. 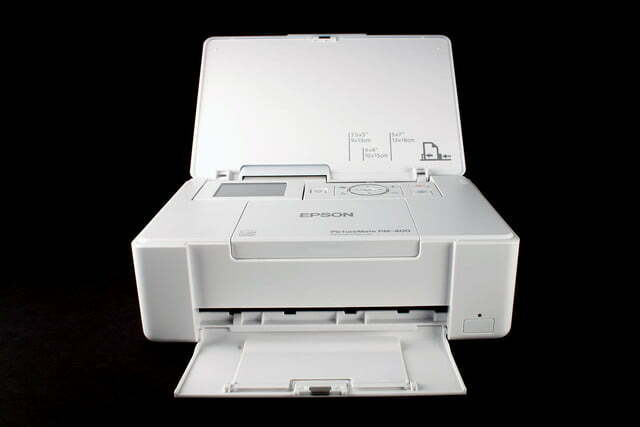 The PM-400 is made to work with Epson paper, although there is an option called “plain paper” in some settings. There’s nothing to stop you from using paper from other brands, but the printer maker generally matches the ink and paper, so quality can’t be guaranteed if you’re using something different. Your prints may look less vivid, or there may not be noticeable differences at all. You’ll have to experiment. The PM-400 can print photos as large as 5 x 7. To connect the PM-400 to a computer, any decent quality Micro USB cable should suffice. A single ink cartridge costs $33 (MSRP). Because the tank contains all four CMYK color, you may not achieve the approximate 100-print yield of 4 x 6 photos if you print more of one color than another (for example, if your prints tend to have a single dominant color, like lots of blue sky). And if you primarily print the larger 5 x 7, you probably won’t get too close to that yield either. That means you may have to replace the entire cartridge before the other inks run out – a common tradeoff for single-cartridge printers.